Information written by MistyTrails Havanese. Photos Courtesy of Deanna and Katie of Victoria BC, along with MistyTrails Havanese. Got a Stinky Dog? Love your dog. Hate the smell? Heatlhy dogs don't stink! Potty Train A Dog Fast- Your Dog Will Never Pee or Poop Inside. System Works in 6 Days! Ask a Dog Vet Online Now A Veterinarian Will Answer You Now! A Question is Answered Every 9 Sec. Some causes of neonatal mortality are prolonged labor, hypoxia and dystocia. It can be physiologic and even behavioral, or even from their environment. Some puppy deaths are from a genetic problem or an infection. Studies show that 20 to 30% of all puppies born die before 6 months of age; most because of neonatal death. If your intuition says something is not progressing as per your thoughts of NORMAL, seek veterinary advise. To avoid puppy deaths, you must work aggressively with your vet, on the first sign of labor problems. I always advise people to go with their "GUT FEELING". Pain and Anxiety, including Maternal Stress are detrimental to the unborn puppy, so keep her calm. It is also good to know, that some vets will ask YOU, what YOU want to do. 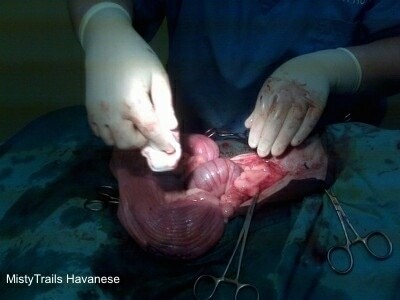 Many vets, will leave the call for a C-section up to you, because you know your dog. I believe there are some legal issues and reasons for the vet to like the client to make the call. One thing I find useful, is to turn the question around on the vet. and I ask HIM, "What would you do IF this was YOUR dam?" #1 The puppies are not deliverable, because of various reasons, including puppy size, pelvic size and shape, or even a pup in a bad position may make the call for a C-section fast, to save the litter. Any signs of fetal distress may make you want to quickly consider a C-section. not all labor leads to a natural birth. Some signs of fetal stress are, black, red or green discharge, which often means the placenta has detached, or fetal discharge (both can indicate problems). A C-section should never be performed BEFORE the dams overdue date, it is always best to wait till labor starts, OR the temperature drops below 99 fahrenheit and stays down. Timing a C-section is EXTREMELY important for puppy survival. The drugs given for a C-section are milder and safer than with some surgeries, as anything given to the dam, will go to the puppies, through the placentas, so just enough to make the dam comfy, yet not so harsh on the puppies. It must be a type that allows for fast recovery, and not have prolonged effects. Tell your Vet, Do NOT use ketamine valium - ket-val, as it goes into the pups, and takes 20 minutes to revive the pups. This is very bad for the pups. Propofol is now, by far, the best anesthetic for a c-section. It is recommended that you tell your vet to give propofol as it only lasts minutes, and then mask them down with ice-o-florine from an anesthetic machine, (or JUST mask till they fall asleep). The difference with the pro-po-fol along with masking is, the pups come out crying, as in a natural birth. A dam in distress, that we have decided to do a cesarean section, is first given some "Happy drugs", including a drug that has atropine sulfate, which helps maintain the fetal heart rates. Intravenous is inserted into usually the front leg, and often she is given fluids. Many dams in distress are dehydrated as well. The IV also helps to maintain normal blood pressure. Prep for surgery. Dam was cleaned and shaved PRIOR to being anesthetized. A final cleansing is done before surgery. An incision from the pubis to the umilicus is done. In some cases with large puppies, and the uterus is overly large, the incision may need to be extended. The dam is well covered up, and kept warm, limiting the exposed areas. You do not want to get the dam too chilled. Exposing her uterus to the air can cause hypothermia, especially in small or already chilled and in shock dams. The Uterus (Uterin Horns) are then pulled out. A secondary Staff is standing by, at the door to catch puppies, and tend to their immediate needs and revival. The vet and assistant in the operating room, have nothing to do with the pups after they come out. There hands are full, making sure ALL placental tissue is removed and they need to close the incision. Never leave the dam unattended after they have had a cesarean. Some vet stitch the dams up differently. Please discuss with your vet about internal stitches. In a 6 month period we have had 2 breeders write in and state their dams had opened up their stitches, and their insides fell out. I have discussed this with my vet and he says it is not possible for this to happen with the way he stitches them up. It is of some concern though, as obviously not all vets stitch up the same. In both cases where the dams undid their stitches they both died. Some pups born from cesarean, are slow to come around. This depends on the stress level and all circumstances. The Revival Crew Must act fast, as ALL puppies are born within a minute. As they come out, the revival staff removes sacs, cuts cords, and begins to attempt to get them all breathing. CPR, mouth to mouth, and aggressive rub downs start. WARMTH, repeatedly using towels from the warmer is also needed. For a C-section, pups can take up to ½ hour to stabilize and breathe on their own. Reviving pups - When the pups start to breathe, and cry, It is a HAPPY MOMENT for the revival team. After pups are revived they are put in a warm box, and the dam is brought out. Her gums are checked to pink up, and her temperature needs to be brought back up. Some dams revive within 10 minutes, some take an hour, but, as soon as she is able to hold her head up, temperature is up, and gums are pink, she can immediately go home and nurse the pups. EXTREME supervision must be given, as a dam with a hard delivery will not always accept her puppies. MAKE THEM NURSE as the nursing will stimulate release of hormones from her brain to turn her into a good mom. Weigh the pups, if they are not getting milk, supplement but ONLY AFTER they have sucked on the dam for a LONG Time. Give the dam a big bowl of broth, or Mamalac as soon as she will take it. If not syringe liquids into her. AGAIN, a litter of C-section pups needs to be supervised. With her pain level, she can easily suffocate a pup, and not know it is under her. I suggest if you need a nap, from an All-nighter, you separate dam and pups. Putting pups in a heated box. A C-section will cost you between $500 and $1200. The normal easy C-section during business hours is about $500.00, then you add anything that was extra, and of course, on off hours labor is time and a half. Just because a dam has had a c-section, depending on the reason for the c-section, she can have a normal delivery next time. If your Dam has to because she is too small, that is likely always the case. But if she has asingleton, then next time, do an xray on day 54.